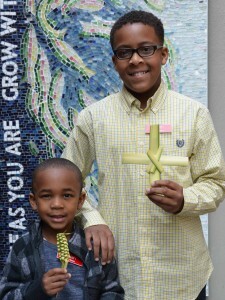 Holy Week services are rich in symbolism and ritual rooted in the celebrations of ancient Christian communities. 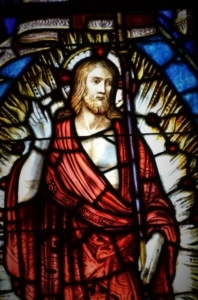 The week culminates in the Paschal Triduum (The Great Three Days) of Maundy Thursday, Good Friday, and Easter Eve and Day. The Episcopal Church follows the historic liturgical tradition of Catholic Christianity. This means that we mark the events of Holy Week and Easter through the community’s celebration of liturgy, a word that means the work of the people of God. Liturgy is likened to a toolbox or vehicle, like a train that transports us through sacred time. Through worship we participate in the events of Christ’s passion and resurrection. PALM SUNDAY, April, 14th -Palm Sunday recalls Jesus’ triumphal entry into Jerusalem when in fulfillment of the prophecy the crowds stripped palms from the trees to pave his way. TUESDAY Evening Prayer at 5.30pm. WEDNESDAY Eucharist 7am, Morning Prayer 9am, Stations of the Cross and Holy Communion at 5.30pm. Commemoration of the Last Supper with Foot Washing at 7.00pm. At his final Passover supper with his disciples, Jesus gave them the commandment “Love one another”! To demonstrate the meaning of this commandment he washed his disciples’ feet. Following his example, we wash one another’s feet. This is a difficult thing, not so much to do for others, but like Peter, to allow being done to us. Intimacy is sometimes difficult, yet always poignant. following the Last Supper, Jesus and his disciples departed for the Garden of Gethsemane where Jesus prayed in lonely agony throughout the night. Three times he invited his disciples to keep watch with him for only an hour. They all fell asleep. The Watch recalls this night. The St Martin Chapel becomes the Garden of Gethsemane and remains the only part of the church that is not stripped of all ornament following the Maundy Thursday Eucharist. Here the sacramental presence of Jesus is reserved throughout the period from 9pm until the celebration of the Good Friday Liturgy at 7pm the following day. Following Jesus’ request to his disciples, the tradition is for each of us to sign-up to watch for an hour from 9pm – 12am. The Church will be locked at this time and reopen again from 5.30am- noon Good Friday. 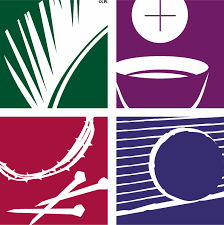 GOOD FRIDAY The Good Friday Walk Against Hunger – an ecumenical way of the cross through Providence leaves from St Martin’s and ends at the State House via South Providence after Morning Prayer at 8am for 8.30am start from St Martin’s. The walk raises considerable money for a variety of charitable causes. Stations of the Cross 12.noon. The Solemn Liturgy of Good Friday 7.00pm. This is a very ancient service comprising beautiful vocal music, the singing of the Passion from St John’s Gospel, the Solemn Collects, the Veneration of the Cross, and the administration of Holy Communion from the sacrament reserved from Maundy Thursday and the Gethsemane Watch. This is the most venerable of all our Christian liturgies. 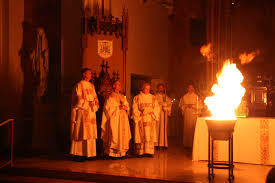 The New Light of Christ is lit from a holy fire. As the Light of Christ radiates outward into the darkness with everyone proclaiming ‘the light of Christ’, we sit for a series of readings recalling significant moments in the history of our relationship with God. These readings constitute our family story as the Christian people of God. We then celebrate the Baptismal Liturgy of new life with three baptisms and the renewal of our own baptismal covenant, after which to the sound of ringing bells, the lights come up, and we celebrate the First Eucharist of Easter. We then party into the night with champagne and chocolate. brings to a climax the celebration of our journey to Easter.